Does it have more User voice and performance banks? • The Arpeggio playback tempo can be changed by pressing the [SF6] TAP button in the Voice Play display. Press this button several times at the desired tempo. NOTE This Tap function is available also in the top display of the Performance/Song/Pattern/Master mode. • Here is a partial list of new waveforms. There are also many new vintage and modern synth waveforms, but these are a bit harder to describe in simple words. Can preset voice banks be edited? • Well, Presets are presets so technically no. However like the Motif XS, you can edit the presets and store them in User Voices You have lots of control of Voices by using Part parameters in Performance and Mix mode. You can change filter and amp envelopes. Cutoff and resonance, etc. using Part Parameters. These changes to do effect the original voice so you don’t need to duplicate the Voice again. If you need to edit completely from scratch for a Song, you can edit everything in a Song Voice and the Voice gets stored with the song. • You can now convert a Sample Voice to a Mixing Voice in the Mixing Play display of the Song/Pattern mode, allowing you to then edit the sampled audio as a Voice. • You can now edit Drum Voices in Mix Mode and store them in User Drum Voices. Will it have more sequencer tracks? Will the MEGA Voice arpeggios differ from XS, like they were different in the ES compared to the XS? • There are many more MEGA Voice arpeggios in the XF. Does it have a step sequencer? Is the board powerful enough to have channel aftertouch enabled in sequencer mode without causing timing problems? • Yes, this is the same as the XS. Aftertouch just uses sequencer memory and many people don’t realize they are inputting lots of data when recording their drum tracks. You can use aftertouch on ever track of the XS or XF as long as you have the sequencer memory. What is the max memory for the Ram? Can i get more that 2 gb? Does it support both DIMM memory and the optional flash boards? If so, what is the maximum capacity of the DIMM memory? The max memory for the built-in SDRAM is 128 MB and is not expandable. You can address up to 2 GB of optional Flash RAM plus the internal 128 MB of volatile SDRAM (as well as of course the 741 Mb of internal ROM). There are two Flash board options, the FL512 (512 MB of flash) and FL1024 (1 GB). You can use either board in either option slot of the XF so a total of 2 GB of Flash Ram is available. Flash RAM retains information when powered off so after you load a sample once it is available immediately on power up and does not have to be re-loaded. It has the flexibility of RAM (you can store what you want and re-write over the memory if you want) and the convenience of ROM ( it’s always there when you turn on your machine). To store a complete 1 GB of samples to Flash takes about 20 minutes ( the writing/erasing process is slower that RAM) , but once this is done once you never have to do it again. This key to understanding Flash. If you had a 512 MB file on the XS , it takes approximately 4 minutes to load. But you have to load it every time you turn on the machine. You also have to save your data as an ALL file each time you make a parametric change like making the reverb a little less on one Voice. This alos takes about 4 minutes with a large file. Loading to Flash is more like ‘burning” a ROM, in that once it is loaded once it remains in memory on power down . It is always there just like the internal Rom sounds until you decide to delete and replace it. The new system has options to save and load ALL files with samples or without samples. So once you have loaded the samples you want to Flash RAM once, you can edit Voices, Performances, Songs, etc and save and load ALL files without samples (which takes only seconds to save and load). So basically we have provided the ability for you to create your own customr "ROM" for the Motif XF and create your own signature Motif by loading the samples and libraries you want into your machine. Having worked with it the XF over the past few months and also having put together large sample libraries like the XSpand Your world, the difference in work flow is incredible for those who like to customize their keyboard with their own samples or third party libraries. Can I take a Flash board out of one XF and put it in another XF without having to re-load the waveforms? • Yes, there is a way to load just the waveform parameters and voice, performance and and song data to another Motif XF. It takes about 10 seconds. Can I use either a 512MB or 1GB board in each of the two slots . Will there be pre-loaded Flash Boards? • Motifator will probably provide this service although it is very simple to load data into the flash and does not take a special tool. It is the same processes as loading an All file, you just have to tell the XF which slot you have a Flash Board installed in. Why did Yamaha build proprietary Flash boards? • Off the shelve memory like memory cards do not have the speed to be used for directly playback of keyboard performances. We selected the best parts available that gave us the cost performance ratio for the boards. What changed as far as ease of use in the sampling process and the process to create multisamples? • Here is a list of some of the new internal features. We have also worked with John Melas and Chicken Systems who have recently released new XS sampling software. They are currently working on making those applications XF compatible and should be finished by the Motif XF release or soon after. However as the XF is 100% compatible with XS files, you can use them already for much of the sampling editing. • Remix” have been added to the Sampling Edit display and Sampling Main display respectively, allowing you to more easily call up these displays. • With this new version, you can load WAV or AIFF files in a singlefolder at the same time. The loaded files will be assigned to the keys in alphabetical order from the specified key. This allows you to easily create your own custom Waveforms. • The File system has been significantly improved making it easier to load and save data. Also the ability to select where samples are loaded means there is still compatibility with Motif XS data that contains large amounts of Sample RAM. You can simply load that file and Point RAM data in the XS to a Flash Board in the XF and load as an All file with samples. For example if you have the a Motif XS file with 1 GB of samples, you can point the RAM data to load to a Flash board and you have converted you XS RAM file into a XF flash file. Here are some other sample management improvements. Continously Loading Voices from the same memory device will not duplicate waveforms with the same name. • This operation will delete all the Waveforms with the same name. This operation will cancel the link status between the Voices and deleted Waveforms, then make a new link between the same Voices and the undeleted Waveforms with the same name. Can I sample my own stuff using internal sampler or load voice libraries with 24 bit resolution? • The internal structure of the Motif XF is 16 bit so there would be no advantage to having 24 bit samples other than they would take up more memory. Can i transfer all voice and perfomances to Motif XF from Motif XS? Will you be able to import voices from previous generations of the MOTIF (MOTIF ES for example)? 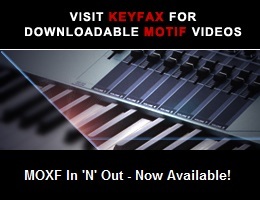 The Motif XF is compatible with many things. • Data Compatibility with the MOTIF XS6/MOTIF XS7/MOTIF XS8 Completely compatible. • Among the data created on the MOTIF ES6/MOTIF ES7/MOTIF ES8, Voices, Waveforms, Sample Voices can be loaded to the MOTIF XF6/MOTIF XF7/MOTIF XF8. • Files of the “All” type (extension: W7A) saved to the USB storage device connected to the MOTIF ES can be loaded to the MOTIF XF. To do this, set the Type to “All” in the [F1] File window of the MOTIF XF. Does Enthernet works on Vista? Does it have mLAN or just FW as an expansion? • The Motif XF uses the new FW16E and is compatible with the YSFW driver. Does it support external Firewire drives? Can you use the ‘legacy’ MIDI ports simultaneously with FW? Does it have usb 2.1 ? • The speed of loading from USB memory is determined by the bus between the internal memory of the XF and the Yamaha sound engine. Making the external connection USB 2.1 would not have increased loading speed because that is not where the data throughput is critical. Does it have Adat output? Is there going to be an editor like the MOTIF XS VST3 but for Pro Tools and Logic? • There will be a Studio Manager editor coming soon. Also Steinberg announced a few days ago new SDK for VST3 developers with a wrapper for AU and VST2. In the future this may be possible. Does it have different D/A, A/D converters ? Is the Display re-draw faster than the XS. • Yes, the display has been improved and re-draws faster. • The keyboard actions are the same as the XS. Will it have a touch screen? Will it have a joystick or two wheels? Yamaha will make an approximately 500 MB Inspiration in a Flash free download available at the release of the XF. This library has been developed so that you can load the individual banks into the 128 MB RAM or the whole file into a Flash board. • Bank 1 is similar to the first bank of the XSpand Your world promotion with the S700 piano, brass, woodwind and vocal samples. • Bank 2 focuses on vintage keyboards and synths with samples from Easy Sounds Organ Sessions and Phat Analog as well as Voices and samples from DCP productions Vintage Keys and B’ Knees. In the user drum banks are new Arabic and Oriental kits and DTX drum kits converted from the free options for the DTX electronics drums. Yamaha has worked with sound developers from around the world to develop new libraries that are both XS and XF compatible. This is just a partial list of what to expect to be available very soon. Will there be an OS upgrade to the XS based on new features in the XF, similar to the upgrades made available to the Motif XS when S70/90XS release came out? • Yes, it is planned for the future to add what is possible. We are working on the list , but know that Tap Tempo, editing Drum Voices in Song Mode and storing them to User Drums voices and improvements to the sampling UI are possible and planned. Are you going to keep the XS in production parallel with XF or is the XS going to be discontinued? • The Motif XS will be discontinued. When will Motif XF be on sale? September? October? Next year? • In the US, the Motif XF will be in stores by the beginning of Sept. If you register on http://www.motifxf.com, we will be sending further information on launch events to people around the world. The Minimum Advertised Price (MAP) in the US is the lowest price that dealers can advertise products. We expect that you will see the following prices advertised.